``Sinn Féin believes that if accepted this Treaty would be determinental to Ireland's interests, north and south. Not only would it result in the further undermining of Irish sovereignty - politically and economically - it would also bring us closer into a European military alliance. ``For Sinn Féin, sovereignty means recognising the rights of the people, not ceding power to unelected officials. We want to see Europe defending our democratic rights, not eroding them. ``Over the next few months Sinn Féin will be mounting a vigorous public campaign in opposition to the Treaty of Nice. This will include public meetings, door to door canvassing and cooperation with groups such as the Peace and Neutrality Alliance (PANA). 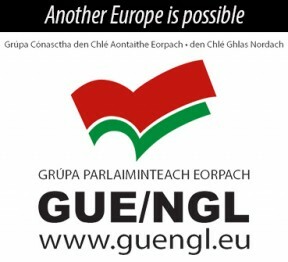 We will also be building alliances with progressive forces in Europe who share our concerns. A Province Once Again ? In 1991, I found myself a political prisoner in Germany in the middle of a two-year trial, conducted in an underground bunker court designed to withstand a military assault. From early on in the proceedings it became apparent that the process had more to do with the criminalisation of the Irish republican movement than the securing of individual convictions. A specific paragraph in the German legal code allowed for this, and had it succeeded in taking effect, Irish republican solidarity groups in Germany could have been outlawed and the possession and distribution of papers such as An Phoblacht could have been deemed illegal. During the course of this trial, dozens of ``expert'' witnesses were called to give evidence. One such was a member of the BKA (Bundes Kriminal Ampt), the German equivalent of the FBI. He had been seconded from the Italienische Abteilung (the Italian Department) to the Irische Abteilung (the Irish Department) in order to study and analyse the modus operandi of Irish ``terrorists'' and the structure and response of Irish and British law in this area. His brief also extended to comparing all of this to the legal code covering political unrest in Italy and evaluating how all could be harmonised with German law when, in due course, the policy permitted. In short, the groundwork was being prepared for the introduction of a common European legal system which would be in a position to suppress perceived political dissent in a uniformed fasion wherever it might occur throughout the EU. This was ten years ago, and one shudders to think how advanced the bureaucracy has become by now. What is in no doubt is the fact that in the meantime the adoption of the Maastricht and Amsterdam treaties has brought the various EU states closer into line and under greater centralised control than ever. This will become all the more apparent when the bulk of the member states tangibly share the same currency,the Euro, by this time next year. The sundry treaties to date, which have seen the gradual draining away of what little control the people of the 26 Counties have over their own affairs, will pale in comparison to the effects of the Treaty of Nice. In the coming weeks various contributors will supply detailed analysis of the political, military, financial and economic implications of the Nice Treaty, all of which will make it clear that the Irish people do not stand to benefit one iota from it. On the contrary, the Nice Treaty will abolish the national veto within the EU in over 30 policy areas, including on EU funds and various foreign policy decisions. There is no provision for the protection of Irish neutrality and in the overall scheme of things our already limited influence and voting power will be reduced further through the trebeling of the votes of the larger states. Above all, the implementation of the Treaty will allow for the introduction of a two-tier Europe whereby the original six members can form themselves into a quasi-federation which will set the pace and tone for the lower tier - into which category Ireland falls. Hardly the situation envisioned when the Irish people were persuaded to join the EEC on an equal membership basis in 1973. Many people are unaware of the fact that the island of Ireland comprises only some one-eighth of the national territory, which extends well out into the Atlantic. For the past couple of years a research vessel has been trawling up and down our offshore waters as part of a seven-year project aimed at establishing the extent and availability of mineral, gas and oil deposits. Preliminary indications would appear to suggest that there is a veritable treasure trove out there. Wouldn't it be ironic if Ireland, historically not considered particularly blessed with mineral wealth, should end up with vast supplies of it? Or would we? Does anyone seriously think that under a centralised EU dispensation we'd be allowed to control our own reserves? The ``legal'' plunder of our fish stocks really says it all. While the Treaty of Nice has nothing to offer us we are, happily, in a position to block it and seek a much more favourable renegotiation. The 26 Counties is the only state in Europe which will have a referendum on the issue. By delivering a ``No'' vote, Irish people can prevent its ratification. In so doing we would actually be acting in the interests of European democracy generally, helping to defend it from the machinations of a bureaucratic elite. Indeed, it's worth bearing in mind that large numbers of people in the other member states are very wary and concerned about the implications of a Nice Treaty implementation. They have been denied the right to a referendum in their own countries and will be looking to Ireland to put a block on this ominous development. Sinn Féin is unequivocally opposed to the Treaty of Nice and all that it entails. We call on all Irish democrats to join us in delivering a ``No'' vote on this issue.